I am a wilderness and landscape photographer based in Australia. initially with a Nikon F90 with 24mm,28-70mm and 70-210mm lenses, all Nikkors. Over the last 3 years I have been using a Mamiya 7 with 43mm, 80mm and 150mm lenses. This is a fine camera ideally suited to wilderness photography through its light weight, low bulk and superb lenses. I use Fuji Velvia film almost exclusively as nothing else seems to come close to capturing nature at its most beautiful. a 150mm Schneider Apo Symmar and a 300mm Nikkor M series. Can't wait to get out to try these out! 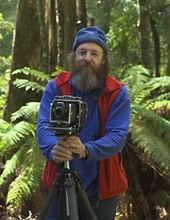 I use a Manfrotto 190 tripod with a Manfrotto 168 ballhead and measure light with a Sekonic L608 lightmeter. I am now using a Nikon 9000ED medium format scanner. to be able to share some of my images with you. that produce rich, sharp images of the highest quality. A huge jump up to a Nikon D810. What a camera! Ultra high resolution and a photographer’s camera through and through. I am teaming this up with a Samyang 14mm f2.8, Zeiss 21mm f2.8 Distagon, Sigma ART 35 mm f1.4, Sigma ART 50 mm f1.4, and Zeiss 100mm f2 Makro Planar lenses. The camera is supported by a Gitzo GT2540 carbon fibre tripod and Markins ballhead with a RRS quick release. Tasmania is an awe inspiring place to bushwalk, from isolated wild coastal scenery to rugged, recently glaciated mountains. To safely walk these places you need experience and good equipment. Some of the gear I use and recommend is listed below.